In 2013, my old faithful 1997 GMC Sierra was giving me about 9 mpg and leaving me on the side of the road on a near monthly bases. I needed a new car. Naturally, I couldn’t go for a V8 because I was moving out of my parents’ house to finish school. I needed something that was small, economical, while still being fun to drive. There was a Mazda dealership in town so that’s where we went. I remember both salesmen looking at each other when I asked them for a manual car. They didn’t even know if they had one in stock. One free bag of popcorn later they returned with keys to a white 2013 Mazda3 with a 5-speed, the only one in town. The only options were a radio and power windows. One test drive later and I was signing on the dotted line. My first new car. It has a 2.0 liter four cylinder engine making 149 horsepower, a 5-speed manual transmission, with traction control (to keep this hot rod in between the ditches). Over the years I’ve averaged 27 mpg and a 12 gallon gas tank means that I’ve rarely ever had to pay over $25 to fill the tank when gas prices go up. 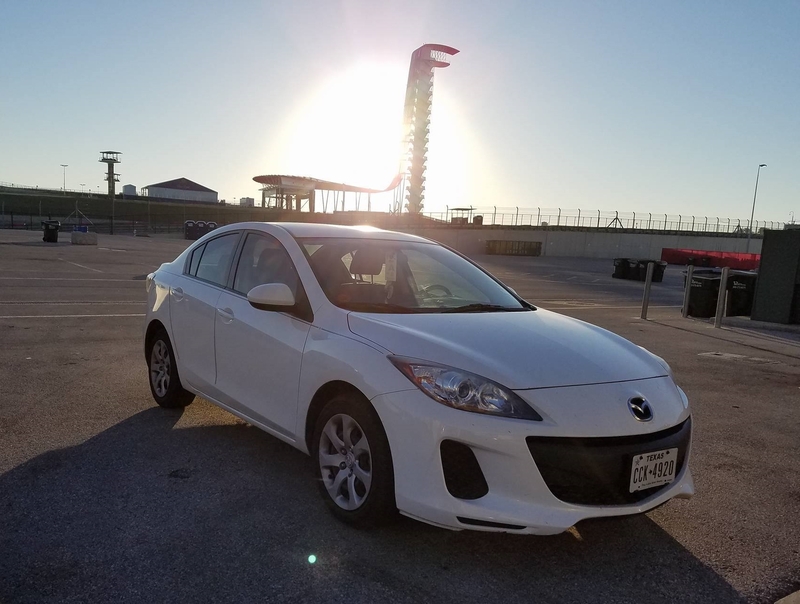 The electronic power steering doesn’t affect the Mazda3’s drivability and is very responsive while feeling light and easy. All this means that the 2013 Mazda 3 follows the golden road for enthusiasts, Driving (definitely) Matters. It’s impossible not to make memories with a vehicle. Often, your own car knows you better than anyone else. It sees you when you’re alone, during times when you’re at your most vulnerable. I’m not talking about just singing along to the radio when “that song” comes on either. It’s when you’re feeling frustrated at the world after a tough day at work, wiping tears off your face while leaving a loved one’s house after a break up, or trying to stay awake after an exhausting day of living. A bond begins to form, whether you love your daily driver or just see it as a metal box with wheels. This article, more than anything, is a tribute to this particular 2013 Mazda3. I can’t say it’s taken me to hell and back because I’m still not done owning this car. I will say, however, that it’s taken me up a mountain at Pikes Peak, Colorado, indulged me in my Cannonball Run fantasies, helped me meet several automotive media celebrities (and given them rides), been a great teacher in my effort to save the manuals, and has been a source of inspiration when it came to starting my writing career. I call the Mazda the Little Reliable, unlike my old truck (a story for another time). 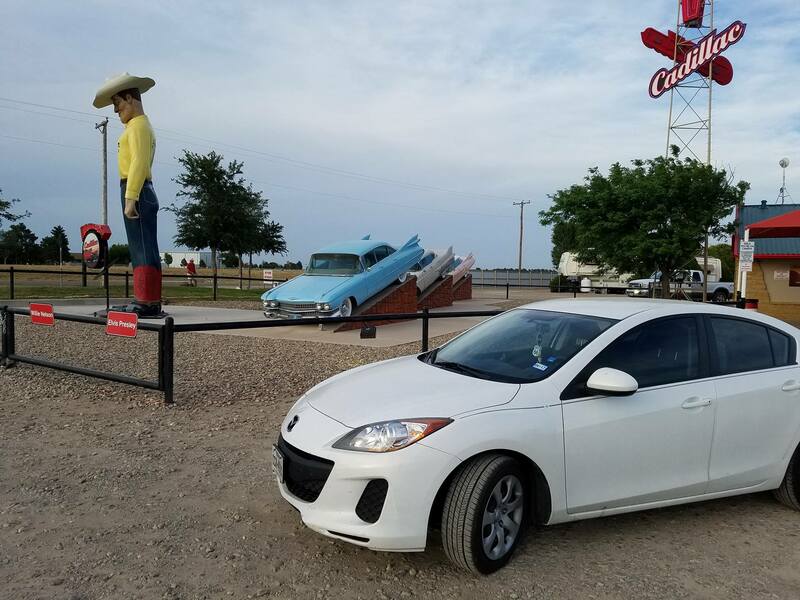 This summer, I drove the Mazda 3 from San Antonio, TX, up to Denver, CO, and back. I was going to cover this year’s Pike’s Peak Hill Climb Race. Reason why I drove was because I think commercial planes are Greyhound buses with wings. I rather spend 10 hours in a driver seat than 3 in coach. Plus I wanted to see the country. 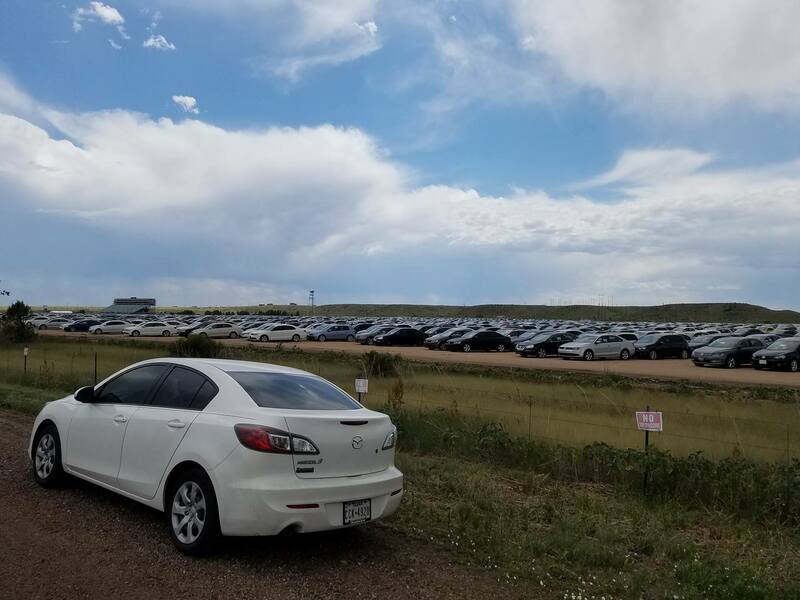 Seeing a mass inventory of Dieselgate Audi’s and Volkswagens near Colorado Springs, CO.
Lubbock, TX. Near the Cadillac Ranch. I remember driving up to Pikes Peak for the first time. 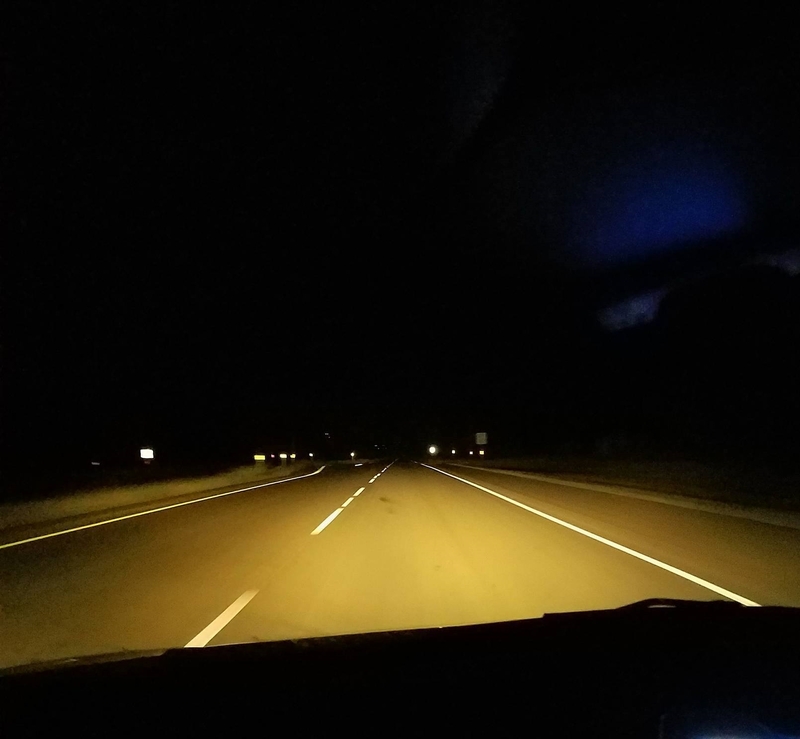 It was 3am and pitch black. I couldn’t even see my own hands on the wheel. I was concentrated on keeping the car in between the lines of the road. 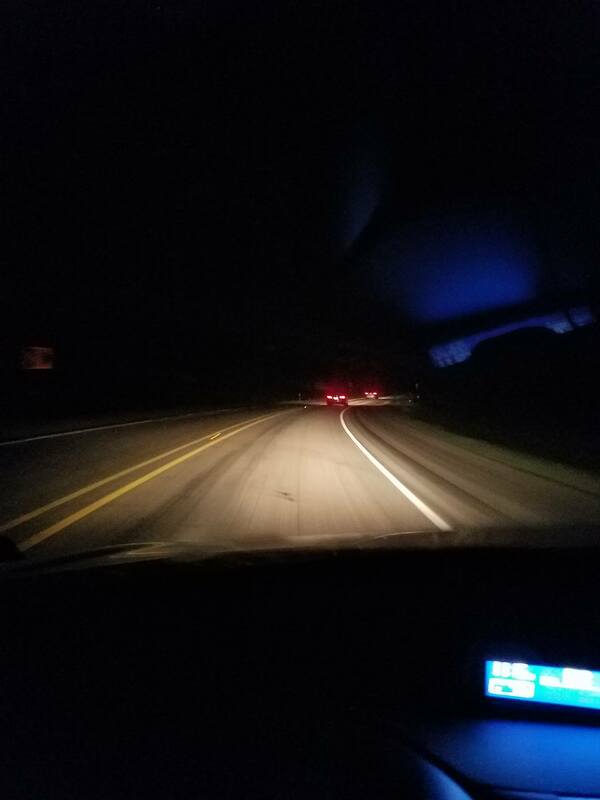 The darkness on each side was so eerie that your imagination lead you to believe that one slip of the wheel meant falling off the Earth. “You’ll starve before you hit the ground” was line I had heard and it stayed with me on that mountain. The Mazda3 never struggled to get up that mountain. felt a sense of pride for the little car. Edge of the Earth, in my mind. By the time I reached Devil’s Playground the sun was just started to rise and I still had no idea of what 13,000 feet up in the air meant. I was more concerned with the fact that it was 30 odd degrees and I didn’t dress accordingly. Once the sun was up I was able to fully appreciate the magnitude of where I was. Up amongst the clouds! With six figure race cars littered around the parking grounds, along with Ford Raptors, safety trucks, a Hummer H1, and lifted cargo vans. Amongst these machines, off to the side, was one little Mazda 3 looking completely out of place but standing tall on its wheels. 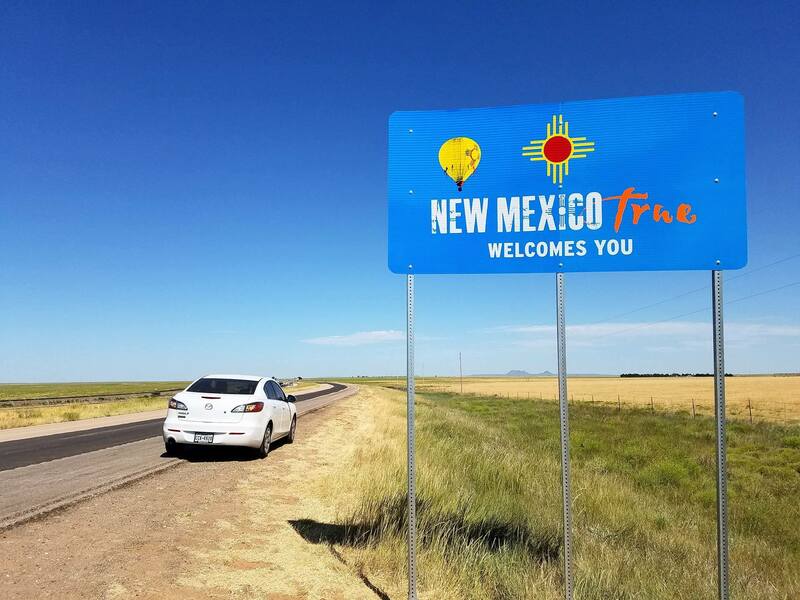 After the event I decided to see if I could make the drive from Denver to San Antonio, straight. Not stopping except for gas and beef jerky refills. Took me 14 hours and was definitely a marathon run for me. The Mazda, on the other hand, didn’t even break a sweat. When I started writing about cars I knew I needed to network and stand out among the sea of young car bloggers. On two occasions I drove from San Antonio to Austin, TX, straight after work, to attend parties hosted by Jalopnik. The main goal being to meet the people I’ve been reading and watching since I was in college. I got to meet Alex Roy, Patrick George, Mike Spinelli, Jason Torchinsky, Magnus Walker, and Matt Farah, at these parties. I even gave rides to a few of these guys to their hotels in my little Mazda 3, like a fanboy taxi. 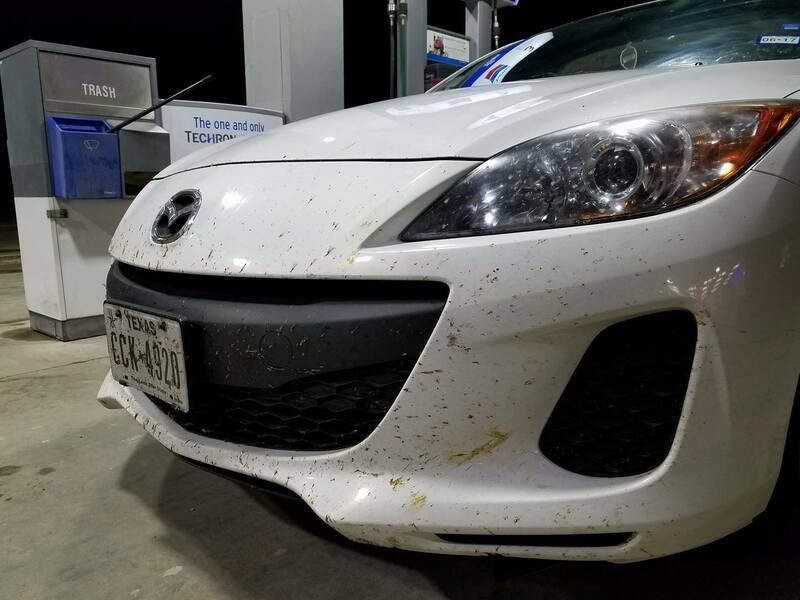 Afterwards, it was back on the road to San Antonio for work in the morning. Totally worth it. 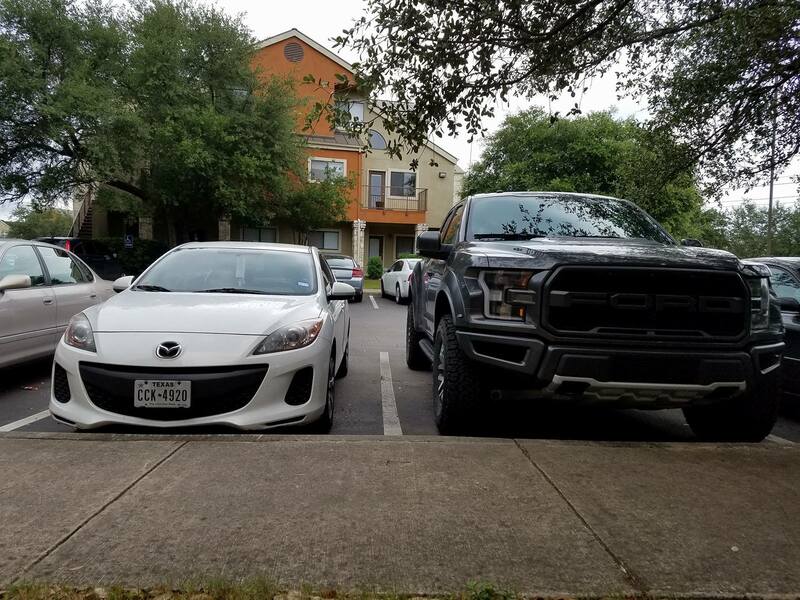 I love my Mazda 3, and so does everyone else who’s met it. I’ve yet to meet an automotive journalist or car person that hasn’t responded with, “Oh, good car” when I tell them what I drive. I love the fact that I’ve gone to media events where I get to drive six figure sports cars around a race track, or go mudding in the latest tonka trucks on the market, and then leaving them to drive home in my little Mazda. It feels like a home inside the driver seat, a home that averages nearly 30 mpg and allows me to change the oil in any parking lot using just basic tools. It’s never given me trouble. Always been there for me. While other friends of mine have struggled with their cars, mine keeps on rolling like a sun dial. The windshield doesn’t even have a chip in it (I probably jinxed myself now by writing that.) Of course it does have a small scratch here and there and a couple of dings from being a small car in a big city but none that you wouldn’t notice unless I pointed them out to you. It’s aged very well. Living in apartments means no garage, so parking lots are the next best thing. If you’re clean about it. Four years is usually when people start looking to trade their cars. I didn’t lease it, I bought it and almost done paying it off. The questions friends and family ask me is if I’ll trade it in for something bigger, faster, or more powerful. I’ve thought about it but there nothing in the showrooms right now that grabs my attention. Not even a brand new Mazda 3. I like mine. Its small, I can fit my entire life in it, nothing has fallen off, and I’ll never go broke trying to maintain it. The only issue I have with the car is that the seats are not very comfortable after 4 hours. My favorite thing about this car is that it is always smiling at you. Mazda, you did a good job with this one. Thanks for the wheels! Read more articles, stories, and reviews here. Next Next post: 2017 Kia Soul Turbo – This Hamster Can Dance!